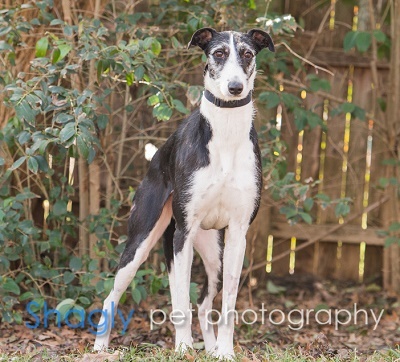 Sage is an estimated 2 year old black and white female greyhound. Sage was found in Osage County, OK as a stray eating out of a dumpster. Caring dog people contacted GALT and she was transported to Dallas by Chelsi, a GALT volunteer. Sage has completed all her medical procedures and is ready to find her forever home. Sage is is considered to be cat tolerant. Sage is the first greyhound/teddy bear mix I've fostered. Seriously, this girl is too pure! Everyone she meets is her best friend and will be greeted with a wagging tail and begging for ear rubs. She's rather submissive, even for a greyhound. If you gently press on her back, you can coax her to sit down or roll over with little effort. Don't let her mysterious background give you pause; this girl is clearly at home in a house. She knows about couches and human beds already, but mostly sleeps on dog beds in dramatic poses. Sometimes she'll sleep on top of the covers at night to keep you safe and warm. She runs after thrown toys and brings them to you before dragging them off to a corner be de-stuffed. She has had excellent house manners thus far - no accidents. She doesn't bark except when left alone in the yard. Sage is not food aggressive or competitive with toys and treats. She'll counter surf if she thinks you're hiding something fun from her, and I am working to redirect this behavior. Sage can sit, so she could probably be trained to wait on command. She hasn't met many other dogs, but she treats them with as much enthusiasm as new people. Sage’s ideal home can be an active one with other dogs or cats for companionship. Sage is a lover and sure to be snapped up quick!